Belfor (Belgian Forwarding) Logistics entails the worldwide coordination of transport by land, sea and air of all types of cargo. Our team enjoys more than 25 years of experience and has a specific interest in heavy lifts and out of gauge units. We offer advice, technical assistance (including all random services) and provide supervision of each transport in order to guarantee safe delivery of the cargo and this to the complete satisfaction of our clients. 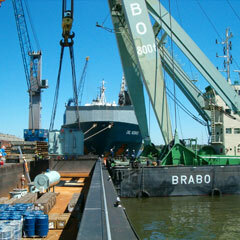 Direct receipt ex vessel’s hold, onto multi axle low-loader for inland transport. 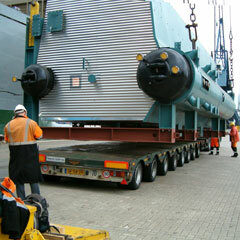 Direct export transhipment of transformer ex barge to seagoing vessel. 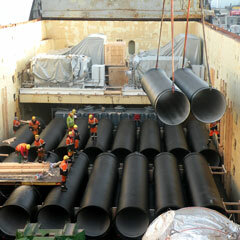 Loading of ductile pipes into ship’s hold. In 1986, Luc De Smedt decided, after earning his stripes at Continental Lines, to share his expertise with an enthusiastic team of Freight Forwarders in a newly established office at Antwerp. Belfor Logistics was established at Verbindingsdok WK. An active trade developed with destination North Africa and Congo. This was later extended to Asia and South America. Belfor Logistics soon built a solid reputation for turnkey projects. Later on the company moved to Noorderlaan in order to further develop its core business of handling out of gauge cargo and heavy lift cargo. In a global market that is constantly changing and highly competitive, it was decided in 2013 to join forces with an outside partner. To facilitate this new cooperation the company was moved to the current address Schouwkensstraat 9, 2030 Antwerp. Belforship is the shipping division of Belfor Logistics NV. Belforship specializes in ocean transportation. 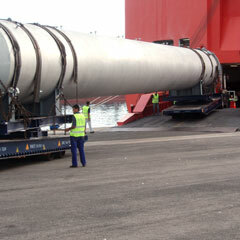 We are well experienced in all dry-cargo segments of the market. For more information click here to go to the website of Belforship. BELFOR LOGISTICS n.v. processes your personal data and this because you use or want to use the services of BELFOR LOGISTICS n.v., and / or because you have provided this information to BELFOR LOGISTICS n.v. yourself. In a contractual context, BELFOR LOGISTICS n.v. does not store your personal data longer than is strictly necessary and / or legally obliged to realize the purpose for which your data is collected. Your data will in any case not be kept longer than the legally prescribed terms. BELFOR LOGISTICS n.v. has taken sufficient technical and organizational measures to guarantee the safe processing of your personal data. These measures correspond to the nature of the personal data and are proportionate to the potential severity of the risk and serve to prevent misuse, loss, unauthorized access, unwanted disclosure and unauthorized modification. The risk of accidental or unauthorized destruction, loss, modification or access to and any other unauthorized processing of the data is limited to a minimum. Unfortunately, no risk can be completely avoided. If unauthorized access is obtained to the IT systems of BELFOR LOGISTICS n.v. we will immediately take all possible measures to minimize the damage to and / or theft of the data. If the rights of the data subjects have been damaged, a notification of data leak will be made to the Privacy Commission as well as to the data subjects. BELFOR LOGISTICS n.v. will only provide your personal data to third parties (within or outside the European Union) if this is strictly necessary for the execution of the agreement with you, or to comply with a legal obligation. You can file a protest at any time. If BELFOR LOGISTICS n.v. uses external parties, partners or subcontractors for services, they will also have to comply with the new regulation. In a processor agreement it will be agreed that they must take appropriate security measures and how they can be controlled. Unless there is a legal obligation to keep your details up to date, you always have the right to view, correct or delete your personal data. You can send a request to exercise this right to info@belforlogistics.be. Your request will be given as soon as possible, but within 4 weeks. Even if you have given us permission to use your data, this consent can be withdrawn at any time. The term 'Belfor Logistics n.v.' or 'us' or 'we' refers to the owner of the website whose registered office is Schouwkensstraat 9, B-2030 Antwerp, Belgium. The term 'you' refers to the user or viewer of our website. You may not create a link to this website from another website or document without Belfor Logistics n.v.'s prior written consent. The information contained in this website is for general information purposes only. The information is provided by Belfor Logistics n.v. and while we endeavour to keep the information up to date and correct, we make no representations or warranties of any kind, express or implied, about the completeness, accuracy, reliability, suitability or availability with respect to the website or the information, products, services, or related graphics contained on the website for any purpose. Any reliance you place on such information is therefore strictly at your own risk. Through this website you are able to link to other websites which are not under the control of Belfor Logistics n.v.. We have no control over the nature, content and availability of those sites. The inclusion of any links does not necessarily imply a recommendation or endorse the views expressed within them. Every effort is made to keep the website up and running smoothly. However, Belfor Logistics n.v. takes no responsibility for, and will not be liable for, the website being temporarily unavailable due to technical issues beyond our control. This website and its content is copyright of Belfor Logistics n.v. - © Belfor Logistics n.v. 2019. All rights reserved.